Retired primary school teacher Alison Russell was advised at a hospital to eat kale and to take Buscopan medication for irritable bowel syndrome to treat symptoms that included months of abdominal pain, bloating and intermittent constipation. She was relieved to be told that she was most likely having a flare up of IBS, which she had suffered from in her 30s. 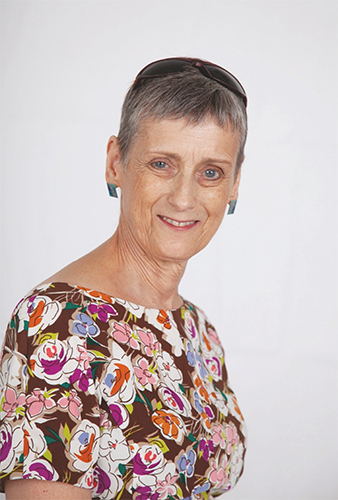 Alison, who was aged 59 at the time, was, in fact, suffering from symptoms of ovarian cancer. Her misdiagnosis was perhaps understandable; she had already just been given the all clear from a CT and ultrasound scan to look for evidence of disease after a blood test indicated that she needed further investigation for possible ovarian cancer. And Alison, now aged 63, says the explanation seemed to fit with only certain warm or hot food making her feel uncomfortable. At the time, she believed she might be exacerbating the problem, as well, with her unhealthy habit of bolting down lunch on the go at work. But a year later, at the end of May 2016, she discovered a lump under her ribs. It was a year after she had retired from 23 years of teaching and she was looking forward to spending quality time with her four grandchildren and three adult children. ‘I convinced myself that the lump was muscle and so delayed going back to the GP until the middle of June,’ says Alison. Unfortunately, she later found out that the lump was, in fact, a sign that she had stage 3 ovarian cancer. ‘For me, because I knew I was ill for a while before diagnosis, knowing what was wrong with me came as a bit of a relief,’ she says. Alison had many of the classic symptoms of ovarian cancer, says the leading ovarian cancer support charity, Ovacome. It has come up with an easy to remember B.E.A.T. acronym of the main symptoms: B is for bloating that is persistent and does not come and go; E is for eating difficulties and feeling fuller quicker; A is for abdominal or pelvic pain you feel most days and T is for toilet changes, bladder or bowel. In most cases the B.E.A.T. symptoms will be caused by something more common and easier to treat than ovarian cancer, says Ovacome. But if a woman has symptoms for two weeks or more – which are not normal – it is worth getting checked out. 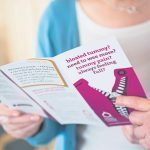 Looking back, Alison wishes that she had asked her GP for a follow-up CA125 blood test three months after the initial one showed elevated levels of the protein, which can rise for many reasons, including the possible presence of ovarian cancer. Alison, who lives in Moseley, Birmingham with her husband, was given chemotherapy and then debulking surgery at the end of October 2016. Unfortunately, not all of the tumours could be removed. This has meant that since then, further treatment – the latest ending in November last year – has been needed to keep her cancer under control. For now, Alison is enjoying life treatment free. She is planning a ski trip with her husband and friends this March and also to take part in the Touch of Teal fundraiser, in which she will take to the catwalk to raise awareness for Ovacome. ‘I have quite a strong feeling that I don’t want to be here if I can’t do anything, says Alison. ‘The whole thing is about being able to enjoy myself and be here for the children and grandchildren. Also, I’m really excited to be taking part in this awareness raising event, as I am quite distressed about the lack of general knowledge about ovarian cancer,’ she says. ‘I was a bit cross being diagnosed just as I retired. I had saved up for a long and healthy time, obviously that’s not going to happen now, but it just means I can pretty much do what I like and treat the family,’ she says. ‘Since my surgery and chemo I have resumed a relatively normal life – enjoying horse riding, skiing, Scottish country drinking (don’t ask), walking, knitting and dressmaking. 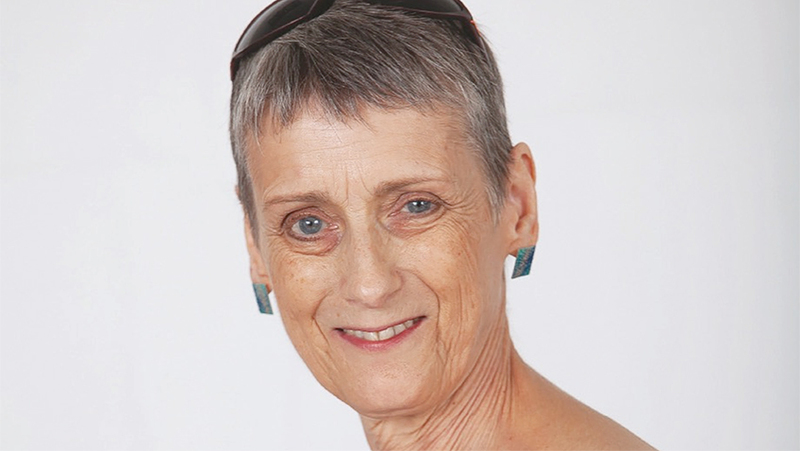 ‘Now I have the added distraction of practising, a couple of times each day, walking in high heels for the fashion show, to make other women aware of ovarian cancer and its symptoms,’ says Alison. ‘Any publicity is good and women need to know that there is life after a cancer diagnosis.’ March is Ovarian Cancer Awareness Month.